LANSA lets you start from where you are and build on what you have. Advance Computing Pty Ltd, based north of Melbourne in Australia, has been a leading provider of specialist financial software and consultancy services for over 25 years. Advance Computing has expanded its market share from a handful of large IBM midrange customers for its financial solutions, to also include numerous Windows implementations. All platform implementations are supported from a single set of LANSA source code and include cutting-edge features like XML data exchange, web access and integrated email and document management. John Martin, Senior Consultant at Advance Computing says, "Being able to offer a scalable solution that can be deployed on multiple platforms has allowed us to expand our market share dramatically. LANSA lets you start from where you are and build on what you have. Accuracy and reliability are of utmost importance in the finance industry. LANSA helps us to manage the complexity and risk of implementing new technologies and getting it right the first time, every time." John Martin, standing on the right, with the MISSION and CMS development team. Back in the early eighties Advance Computing, then known as M&S Computer Services, developed the first versions of its legal and financial software solutions that are today known as MISSION (Mortgage Investment Software System) and CMS (Contributory Mortgage Scheme). The software was written in conjunction with the company's first AS/400 customer, The Banksia Financial Group, a large non bank financial institution, who is still a happy customer today. All applications were written in RPG2 and had been migrated from the IBM System 34/36 to run on the IBM AS/400. Although very complete in functionality, the application didn't have the right architecture to take forward. The database was internally described, many of the files had multiple record formats and the RPG language lacked productivity. The applications would only run on the IBM AS/400, but that was not a concern at the time. In 1989 cross platform deployment wasn't on anyone's radar yet. Martin explains, "The challenge then was to reuse the existing business logic - initially most of the RPG2 programs - while at same time updating our software to native AS400 and taking advantage of the DB2/400 relational database. We selected LANSA because of its central data repository and productive 4GL." In 1989 cross platform deployment wasn't on anyone's radar yet. Using the LANSA Repository, Advance Computing first reworked the database to a proper relational design and externalized the business rules and validations. The RPG programs were initially left as they were, except that they were re-engineered to work with the modernized database. "We decided for the incremental modernization approach, as we could not afford to break with what we had. We wanted to avoid a disruptive and risky big bang approach," explains Martin. After back-engineering the modern database design into the RPG programs, Advance Computing embarked on the next step, the gradual replacement of RPG programs with LANSA programs. Replacement was basically done one-by-one, but there was a lot of consolidation as well, where multiple RPG programs were replaced by a single LANSA program. When in 1992 LANSA announced the first version of its Windows development and deployment tool, at that time called LANSA PCX, Advance Computing was one of the first customers to make the switch from AS/400 development to Windows development. The Windows tool allowed Advance Computing to use the same high level LANSA source code to either generate Windows-based C code or AS/400 based RPG code. By then Windows deployment had become a priority for Advance Computing, as several smaller AS/400 customers indicated they wanted to move to the Windows platform. Initially the MISSION and CMS solution were still partly relying on RPG and could therefore not be deployed in their entirety in a Windows environment. The moment all RPG programs were redeveloped with LANSA, around 1993, Advance Computing could offer its solutions in the Windows environment, of which the vast majority of customers make use today. We wanted to avoid a disruptive and risky big bang approach. The MISSION and CMS solutions have been continuously evolving. MISSION was extended with a web-based online banking system that allows customers to offer their clients electronic access to their accounts to securely transfer money, view their investments and download statements in PDF format. Both solutions have been extended with LANSA Integrator for XML data exchange to third parties. For example, with the Australian Taxation Office for instant verification of a client's tax file number and for periodic reporting of investment returns. Other electronic data exchange include reporting to APPRA, the Australian Prudential Regulation Authority, and with Banklink, a service solution that allows clients to authorize their fund manager to give a nominated accountant access to their financial records. Other integration points include near real-time two-way synchronization with MYOB, Australia's most popular Windows-based accounting system, and on-demand integration with Microsoft Outlook, Excel and Word and Adobe for PDF creation. The built-in document management module originally only worked with documents created by MISSION and CMS, but was later extended to check-in documents from other sources. It lets you search multiple document formats by multiple search criteria and turned out to be so popular, that Advance Computing now offers a modified version as a standalone solution. A web-based branch and agent system, currently being implemented by Banksia, allows Banksia's 20+ branches and 300+ agents to have a sub-group of clients in the Banksia system, so they can do business on behalf of Banksia. Banksia can define different levels of authority and individual access to loan/investment products and view reports that show the overall performance of products. In addition Banksia's branches have Windows client-server access to the core functionality on the IBM i, using LANSA on the client, on the server, plus Citrix and LANSA middleware. Advance Computing is often the first to adopt new technologies internally, as a way to get familiar with it. "We try new technologies for ourselves first and then we can very confidently offer them to our customers," explains Martin. As an illustration Martin gives the example of how Advance Computing recently used LANSA Integrator to extended its web-based support system with a facility to automatically re-direct support requests to the iPhones of technical staff. Martin feels his staff is well prepared as some MISSION customers are now looking at offering their clients the option of receiving alerts by SMS. We already implemented iPhone integration to our own technical staff and can very confidently offer that technology to our customers. H.D.& C. Securities Limited is one of MISSION's Windows-based customers. HD & C recently moved from a less scalable solution that required deployment in an emulated Unix environment under Windows. David Joyce, General Manager at HD & C Securities expects that the move to MISSION will provide for a very quick return on investment. "MISSION is a perfect fit for our company and I am very impressed with the XML integration, paperless office and document management features," he says. Joyce is also pleased with the way Advance Computing has built a framework around the application for managing security, printers, Windows integration, back-ups and other housekeeping tasks. "It's all very streamlined," he concludes. Trevor Goode, General Manager at The Banksia Financial Group, one of the IBM i customers, regards reliability one of the biggest attractions of the combined IBM i, MISSION and LANSA technology. "We prefer the stability of the IBM i environment," he explains. "The hardware is reliable and the software is reliable as well. We just don't have any downtime." Having said that, Goode is also pleased with the multi-platform capabilities of the LANSA-based solution, as it allows Banksia to offer its 20+ branches and 300+ agents a mixture of Windows client/server and web access. Goode notes that the online banking module benefits Banksia and its customers. "It is very seamless and hands free. Generating and processing financial transactions is an important part of our business and the online banking module saves us a lot of time in processing, identifying and handling transactions. Online investment transactional capabilities is an important feature and enables our clients to view and manage their investment accounts from anywhere and at any time of the day. Being able to provide clients with online access is an additional selling point for our products. Plus the site provides us with a platform to publish information for our customers." The online investment facility also drastically reduces the need to send out paper statements. Goode estimates that the facility will potentially save Banksia from having to print and post a few hundred thousand interest, tax and maturity advice statements every year. However, at the moment part of the client base still opts for delivery by post. Goode believes that in the future Banksia may extend the choice of delivery methods with Short Message Service (SMS) to mobile phones. Goode concludes, "Advance Computing has proven to have the skills and the tools to provide scalable and reliable solutions to meet the growth of our business. We find them very flexible to deal with and they always seem to be able to incorporate our customization requests in a timely matter." Our clients can view and manage their investment accounts from anywhere and at any time of the day. "Being able to offer a scalable solution that can be deployed on multiple platforms has allowed us to expand our market share dramatically," says Martin. "Our customers range in size from new startups that are managing several million dollars with a couple of staff to firms managing in excess of a billion dollars with over 100 staff." "Most customers run Windows implementations of our software, while some larger finance companies are ideally suited to the IBM i Server. LANSA allows us to deliver a scalable low-cost solution on a variety of Windows and IBM i operating system versions that we can support with a single set of LANSA source-code." Martin feels that LANSA has been a major contributor to the fact that his team has always been able to rapidly incorporate ideas and requests that have come directly from customers. "Having set up a good architecture and having a productive tool has made it easy to deliver just about any enhancement our customers have asked for," he says. "It's important to understand your customer's business and have a sound knowledge of their requirements. LANSA has allowed us to focus on the business requirements by giving us a set of easy-to-use development and integration tools that reduce the complexity of implementing new technologies," says Martin. Martin feels that his solutions are more modern than most others available in the market and his development team more agile than that of other solution providers. "Our products have continuously evolved with LANSA's technology. Likewise, our development team is continually improving and developing through the training and support supplied by LANSA." LANSA allows us to deliver a scalable low-cost solution on a variety of Windows and IBM i operating system versions. 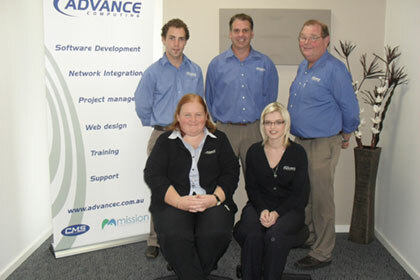 Advance Computing has been a leader in its field for over 25 years. The company's MISSION and CMS solutions are used by finance companies and legal mortgage practices throughout Australia. Advance Computing's professional team also provides network management & support, web and application development, project management and specialized training courses. Plus the company's retail outlet offers sales and services to the general public. Advance Computing has formal/certified partnerships with LANSA, Microsoft, Cisco, Apple and HP.